Sefi opened her eyes due to a sudden jolt she received. What she saw was the inside of a carriage that was jolted around due to the uneven road. Her Miss and the Karusii sisters were gathered around her. There was another girl in brownish yellow hair that she didn’t know in a high-class servant-like clothes. She and Maya seem to be talking about something. By the way, Maya was wearing a silk dress like the one nobles wore not her usual village girl dress. Chiri noticed that Sefi had woken up and informed the others. Zira then came to exam her. Maya approached her with the unknown girl. To be honest, Sefi didn’t really understand the current situation. But since her Miss is alright, then it all that matters for her. Sefi looked at Florea who was watching Maya and Sefi talking with interested eyes. It looked like the girl called Florea spoke in a language Sefi couldn’t understand. But Miss Maya somehow could speak the language. As expected from miss Maya. Maybe because she felt relieved, Sefi felt a heavy drowsiness descended upon her mind. Sefi once again sleep. It might be the backlash of healing magic. Even so, Maya is glad that Sefi condition is fine. Even so, Maya was interested to find out the true identity of this group of people. For that, she needs to be able to communicate properly. Luckily the girl in front of him, Florea, was quite friendly, talkative and cooperating with Maya attempts. She thought, perhaps this group might be key for her aim of stable peaceful life, after all, even children that someday they would be conscripted for the constant war in Soipora that had been raging for the last 45 years and that the current Feudal Lord of the village was a power-mongering madman. Like that the crash course language lesson between Maya and Florea continued until the carriage reach the village. While Florea and Maya while still in the carriage, Yuuto had finished with transferring the authority of 6 Steel Golems that he had created in the surface to Nisani and assigned some Knights to guard the deserted city of Urlaubshaven, that Yuuto planned to turn into a resort village for Neuschwanensee citizen. Then, he dashed towards the village in a very high speed, that before long he had passed the carriages and reached the village in just under 6 minutes, it depleted his SP bar by 20%, though. When he arrived at the village outskirt, he was greeted by the sight of numerous blue-colored flags of three conjoined golden circles in Brunnian Link, the so-called Borromean Ring, inside a silver double squares that adorned Forward Operating Base that the Gate Knights established around the landing point of Luftzeug Zwei in the northeast of the village. Not far from that place, near the edge of a field and heavily patrolled by the Knight were the makeshift open-walled pavilion that had been prepared by Kiyomi for the lunch location. By the way, the maids group was still in the village distributing relief supplies, while Mitteherz and his diplomatic staff were talking with the village leaders. After exchanging greetings with Kiyomi who was waiting in front of the door and being stared at by the young girl trio, Yuuto entered the pavilion and was greeted by the phrase “welcome back” by the rest of the girls. They then enjoyed the lunch-slash-picnic. On the table were various kind of sandwiches, gimbabs/makisushis (or seaweed rice rolls), onigiris, pastries, fried meats and vegetables, bread and pickles with fresh juices and teas as the beverage. The green-yellow wheat look-a-like plant beyond the open-wall pavilion that spanned far and wide swayed under the wind, creating undulation similar to the waves in the ocean, was worthy of a painting scene. Well, let’s just think that if they fight with each other, then that means they are close. Still, Yuuto was rather impressed by the unexpected side of the girls. Saki made a high five with Mizuki that somehow turn into a hand clapping game while Tsukimi sang the Mochi Pounding song. The young girl trio was as friendly as always. ‘Eh, cake for lunch? Really? Are you Marie Antoinette?’ Yuuto began retorting in his mind. He won’t say it out loud, though. The lunch-picnic continue as the girls trio stopped playing their clapping game and resume their eating. Yuuto continued chatting with Ichiko about Neuschwanensee status. Luckily the scale of the food and material aid to the village hardly cause that many dents on the Neuschwanensee’s reserve food stockpile level due to recent abundant harvest. But since even after using Player’s Inventory, it was quite hard to transport such large amount of materials to this village. Further aid delivery would either need air, water or land route. 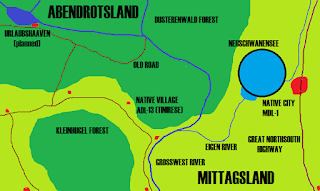 Since Luftzeug Zwei wasn’t optimized for cargo delivery (it was experimental craft testbed), there are no direct road from Neuschwanensee to the village and the water route was rather complicated since they need to go downstream first before going upstream, Yuuto thought to ask the Engineer corps for whether it was possible to construct road to the village which can then be extended to join the Old Road to Urlaubshaaven. Saki came and hug Yuuto’s arm and then plead with a childish tone. But the real problem was Yuuto’s arm was in the middle of the valley of the shadow of death… Yes, there was a deep valley and there were some really deathly stare, hence valley of the shadow of death. Yuuto didn’t have any intention to try to find who was looking with grim-reaper stare at him. Some truth better left uncovered, not every question need to be answered. Although side tracked a bit, Yuuto continued his story about fighting with the bandits (the sanitized version, of course, no mentioning about cutting arms and legs), rescuing the captives, getting stabbed with a knife… He omitted this part of course. After all Stella would ridicule him to no end if she knows. Also, he omitted the part with creating a homunculus. After hearing this, the young girl trio seems to be enticed by Yuuto’s story. After all saving village and subjugating bandit are the basic of basics of RPG games. But Ichiko began to have shadow hovered over her expression (and heart). Yuuto felt that he didn’t need to hide or cover it and so he answered truthfully. Stella seems to notice the implicit meaning and so she couldn’t help herself to see Yuuto with a different light. Yes… Yuuto. The man who was calmly eating in front of them is a bona fide “Murderer”. A Murder is a Murder, no matter how much it was sugar coated with excuse and justification, it is still an act of depriving life from others, an universal malum in se. Unlike the people who lives in turbulent times, the girls came from a relatively peaceful society of Japan that was one of the countries with the lowest murder rates per population in the world. They hardly ever meet with murderers, let alone associate with one. So to be honest, they were afraid of Yuuto a bit and was uncertain how they should act near him from now on. Can they do this? Will they do this? Ichiko and Stella can be considered as the adults among the girls so maybe there would be no problem, but could they let the teenagers Saki and others do the same? Maybe because they noticed Stella and Ichiko suddenly had dark mood around them, the girls trio began to ponder if there were any problem. Suddenly, Kiyomi began to speak. Her tone was gentle yet firm. He had seen what the bandits had done with his God’s Authority, but he shouldn’t mention this to them. After all, there was no point mentioning all those murders, rapes, and wanton violence to the girls. Due to this reason, he hardly felt any guilt, though. After all, bad people need to be punished. Even baby knew about this, as the infant morality studies had shown that they prefer individuals with prosocial behavior. Then again, this might just his rationalization and justification. Without any hesitation, Kiyomi grabbed Yuuto’s hand and held it tight while she looks directly at Yuuto’s eyes with a sublime smile. Yuuto replied back with a pleasant smile at Kiyomi. Chie placed her hand atop Kiyomi and Yuuto’s hand. This might be his overthinking, but Yuuto felt a sense of displeasure from both Chie and Kiyomi. The girls trio joined in. Although it was doubtful if they really understand the current situation. Ichiko and Stella also joined in. This was like a team huddle before a game. Maybe because she thought like that, Saki suddenly raised her hand and yelled out a shout. The other girls and Yuuto unconsciously responded with “Ou!” Then they returned back to their seat and continue their repeatedly interrupted lunch-picnic. Even if he is indeed a murderer. Yuuto is still the same Yuuto, their kind and reliable guildmate. Based on his personality that he had shown back in the game and after arrived in this place, he was a person who does murder not out of malice aforethought, but necessitated by the situation. At least that how Ichiko and Stella want to believe. After they had finished with the lunch. The girls trio was playing with the wheat look-a-like with Chie supervising them not far from the pavilion, leaving Yuuto, Kiyomi, Ichiko and Stella in the pavilion sipping teas while enjoying the green and golden waves. They were talking about what should they do with the village. Since they had gained the trust from the village, Yuuto thought to make the village as a local information source. After all, there are many things they don’t know about this new reality they found themselves in, such as the level of the technology, society, government, language, religion, magic, etc. It would be nice if the locals could voluntarily provide the answers. Since Ichiko was also interested in the local crops, Yuuto thought to ask locals for the seeds. Too bad they still had many difficulty in understanding the language. Even though the villagers could serve as a mediator to good relationship with local government. But for that Yuuto need to wait until Mitteherz and his staff successful in their discussion with the village elders. Yuuto was a bit concerned about the possibility that he had offended local government by doing what was basically unlawful border entry and illegal goods import. After all only wiseless person would seek enemy in unknown lands. Although the bandits he just ‘pwned’ was very weak, that didn’t means that there are no people stronger than Yuuto. After all in RAHO Yuuto were just ranked in [10-12.5%] bracket. In a game with several million active players, that means there are still hundred thousand players stronger than him. Yuuto might be as big as Tuna, but there are still a lot of Whales in the Ocean. Being conceited over his own power was a sure receipt to doom. As for the native government, even after 4 days after he opened the gates, there wasn’t any local leaders or government representatives visiting Neuschwanensee. 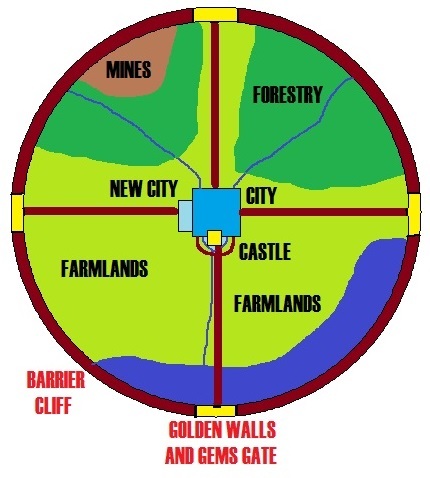 Even the nearest city, codenamed “MDL-1 City” (since the Native name was unknown), located just outside the Eastern Gems Gate, had closed their gates and was in a state of high alert, according to the scout. By the way, the village where Yuuto visited right now was called “ADL-13 Village”. While they were still discussing about how they help to rebuild the villages, Kiyomi mentioned the matter that all the girls had agreed to do before as she poured the sweet honeyed tea at Yuuto’s cup. Yuuto was a bit intrigued as it was rare for the girls to agree upon something, other than “Bath Usage Schedule” (since the girls bath together… and no, Yuuto didn’t dare enter the Holy Land, after all, his Hiding Skill is lower than Chie and the Twins’ Detection Skill) . Kiyomi, Ichiko, and Stella had trouble to describe the phenomena that they just felt not long before Yuuto come. Which reminds Yuuto of the same foreboding feeling he received when inside the ruined fort. Chie came with the three girls and spoke out the words. It seemed that they noticed that Yuuto and the pavilion girls began talking about serious stuff. This might be the first time they clearly felt the malice that was emitted by a corrupted Divine Shard. Even so, the girls (except or Chie) seemed surprised by the existence of Instance in this place. After all, Instances are from the game, and this world is not a game, right? Then perhaps that Instance also were transported to this world. There might be a connection between them. Stella reminded of the horror she had when she was just a low-mid rank player. Well, except for Yuuto, Chie, and Ichiko, the others never cleared or entered that Instance before. Mizuki suddenly became enthusiastic when Yuuto mentioned about a clue. However, even in the game, entering Instance need proper preparation such as equipment check, stockpiling potion and magic tools, examining current Instance monster distribution, adjusting macro command, etc. Now that the Instance had become “real”, they must not enter in Leeroy Jenkins style. Who know how the Instance would be translated into this world’s logic. In the worst case, it could become a total party kill. Mizuki was a bit disheartened, but the other girls began to cheer her so her expression soon brightened. In the first place, she was not a gloomy girl. Yuuto patted Mizuki’s head while reassuring her. When he noticed what his hand had done, he quickly retracted his hand back. Fortunately, Mizuki seemed didn’t hate it, but somehow Tsukimi and Saki began to stare at Yuuto’s hand. All of a sudden, a Knight kneeled before the pavilion and shouted out. The girls seemed to be a bit perturbed by this news. Yuuto then began to inquire. The rest of the girls nodded. Either way, it was unlikely that the bandits would be composed fully of light cavalry. Yuuto guessed that perhaps this group is from a local ruler. Either way until they sure that the group isn’t hostile, better to prepare than to regret. Yuuto then made a wry smile and faced the girls who were showing a rather tense expression on the account of the unknown group. But if it’s possible, Yuuto wouldn’t let their hand be stained, just his own. Q1. How Mayana could learn language that fast? A1. She is a Natural Linguist Lv4. Yeah, she had this unique skill. She is also helluva smart. She observed the words repetition, placement, possible meaning, and characteristics. In other words, she unconsciously use natural statistical properties of language to deduce its structure, including sound patterns, words, and the beginnings of grammar. The so called linguistic computational method. She is after all, come from an educated nobility background. Q1a. Then why can’t Florea do the same? A1a. Florea isn’t that smart (she is the lowest 3 among the Guardian with Mesidora and Temidora in intelligence, even when she is a magician [RAHO magic came from SOUL stats not MIND stats]), but she do picking up some native words from Maya (hence she was observing Maya talking). However, her progress is much slower than Maya. Q2. Kiyomi sent 500 Knights to Yuuto, what happened to them? A2. They are the one who guard and operates the carriages that brought the goods and captives back to the village. Since only dozens actually needed, the rest were just scouting the surroundings or clearing the route for the carriages or guarding Urlaubshaaven. Q3. What is Yuuto asked Nisani to do? A3. Resurrection experiments, after all Yuuto still don’t know how resurrection mechanics work in this world. He got a nice 50s guinea pigs after all. Q4. Why Luftzeug Zwei need to be carried by Crystal Dragon Princess? A4. Luftzeug Zwei is still not installed with Aerodynamic Engine alias the propulsion engine, since it was still in the atmospheric floating test stage. Sothe CDP Chang’E acted as the “engine” hardly a proper task for a Celestial Dragon. Even though Chang’E want to protest, she couldn’t disobey Kiyomi, her summoner. Why Kiyomi don’t summon normal dragon? Normal dragons aren’t cute. There is a reason why except for the mechanical Arandur (Yuuto’s gift), the rest of her Guardian Spirit summons were composed of beautiful girls/women even though they are not that strong or low tier summons. Q5: Why the players translation function don’t include natives language? Q6: What is an Instance? A6: Instance, the Dungeon Maps of RAHO. Each Instance had a various theme, levels depth, enemies, drops, traps, etc. It could be said other than hunting Gigantic Monster in the Field Maps, clearing the numerous Instances of RAHO was one of the main RAHO gameplay focus. It was because Divine Shards only could be found inside the Instances and clearing an Instance would grant the players a random Divine Shard. If the player didn’t have that Divine Shard before then he would have an increase in his DSL. Since what players receive what Divine Shard on an Instance were randomized at the Character Creation, no player knew which Instance had the Divine Shard they required to DSL UP. This force players to scour over two hundreds Instance in RAHO. Q7: Why the girls didn’t felt the malice aura from the instance when they were following Yuuto and Chie before? A7: First, they were quite far behind Yuuto and Chie. Second, their DSL were still low than Yuuto or Chie. Even the highest DSL Stella barely able to detect it. If Ichiko was there, she could detect it, though. Q8: Why Yuuto thought that it will be unlikely that the bandits would be composed fully of light cavalry. Haven’t he heard of nomadic raiders like Scythian, Turkic and Mongol tribes? A8: The place they are now is a heavily forested hilly region far from any vast grassland. Mountain bandits akin to Eurasian nomads would be hardly come to place like this. Or so he thought. Also bandits will need a lot of capital to procure equipment and horse for light cavalry. The Demon Army really get defeated... When they were slouching back to the north near the Central Desert they get ambushed by Human Army that was waiting from them from the Grasssea Plain. Oh the map didn't show the nations. It showed the region. 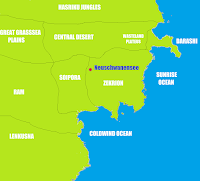 Zekrion Region is actually cmposed by Seven Kingdoms in loose Alliance. Dinember Kingdom mentioned in the prologue belonged to this Alliance. Lenkusna Region got Tributary Kingdoms of Ram, Tribal Alliance, independent polar tribes. It didn;t get show in the map but the southern Lenkusna actually crossed the artic circle and so covered in permafrost. 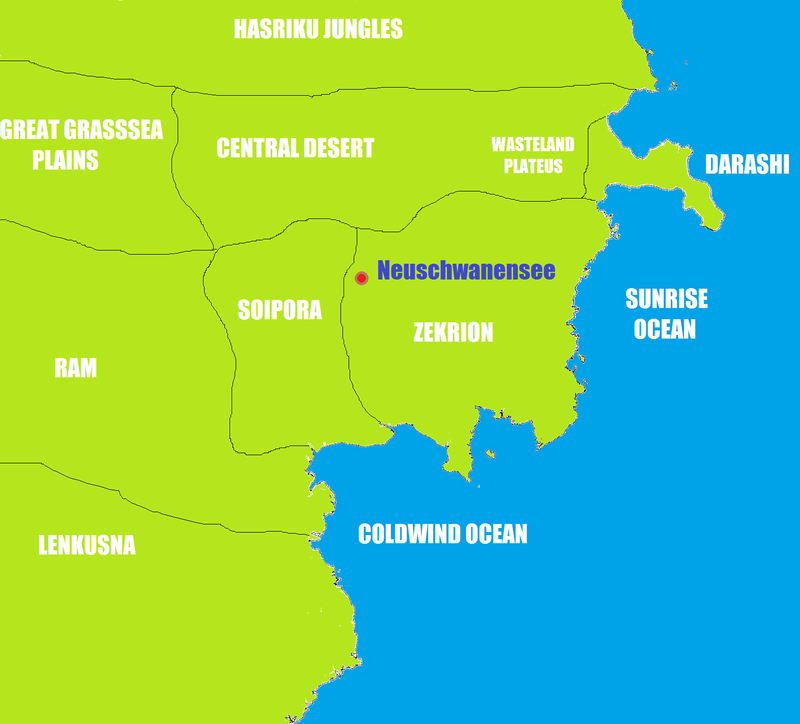 Barseba is located far north after the Marshyel (beastkin) territories of Hasriku tropical Jungles (the Equator passed through Hasriku). By the way, the Central Desert is a Rainshadow Desert similar to Gobi. There is another desert in the farwest part of the continent near Shiti and Fohel. The Great Grasssea is only a semidesert beecause it was not that greatly rain shadowed (Ram region was a relatively flat river plains). Darashi peninsula is mostly subtropical and Typhoon magnet. East from Darashi Peninsula (not showed in map) are series of Island Chains (the biggest is big as New Zealand North Island) that ended at Aipa minicontinent (mini is actually a misnomer). aaaargh the clifhanger ( rolling and throwing tantrum), please i want more yukkuri onisan. (^_^) cant wait for the next chapter. Really love this story, its great! keep up the good work! I like the translated stories on this site as well, but this original work of yours Im particularly fond of :) thanks for creating this world for us to enjoy, and yeah.. that cliffhanger! I just want to say that this novel of yours is amazing. It's very clear just how much thought you put into each of your chapters, and your writing is very enjoyable despite (from what I can tell) English not being your native language. In 1377 England had only 3 cities above 5000 inhabitant ! The Holy Land of NS is indeed overcrowded. You can't stuff 80000 people in 54 square km and hope they to be self sufficient. However, when you got fully upgraded Enchanted Wheat, fully upgraded Blessed Fields , fully upgraded Irrigation, and other game-like element, all real life are broken down. After all, in game, if you upgrade the field the output increase right? The crops yield of NS is way above even normal modern RL value, so they need less farmland than corresponding medieval world. For example, NS Enchanted Wheat yield is consistently 12 Metric Tons/hectare with only 3 months of planting. It was a C4 plant, had rhizome to bind nitrogen from air, disease-resistant, and capable of absorbing ambient mana to aid its growth. Midzu continent is indeed populous, after all how could you explain Rajul Dinasty of Ram "One Million Army" (although most of them is conscript)? The Eastern part of continent is more rural, than heavily urbanized countries of the West and North. And the region where NS is located is just a backward undeveloped rural area (imagine North Dakota or Central Siberia) that is not representative or what Midzu people think about normal Remna nations. It's also not technically a "Medieval world" we familiar with in the Technological or cultural wise, they are more resembling *spoiler*, with *spoiler* albeit they haven't 'discover' wide-spread centralized production (factory) or mass production yet. The total of Population in Midzu continent is about X00 millions in an area as big as Northern Eurasia (~29.000.000 square kilometers) giving a population density comparable to that of modern United States. Yuuto watched those in Youtube before in RL. He just utilize them. About how he could remember them all? Well, however unlikely that he remembered everything completely, his stats compensate the rest. ... or maybe Denember Kingdom's knights? To scout the Chemkla's surrounding? But isn't this place too far away? "... girl in front of _him_"
A rather late comment, considering the date, but I don't think a certain term was picked correctly - that someone who kills is a "murderer". Certainly the reverse is true, murderers are killers, but...other people who kill, like executioners and soldiers, are not quite as maligned as murderers. A Murder is a Murder, no matter how much it was sugar coated with excuse and justification, it is still an act of depriving life from others, an universal malum in se. Even if they are not maligned in proper, you wouldn't see them in the same light anymore. Ask yourself, if you know that a close friend of yours kill people (deliberate or accidentally), will you see them the same anymore? can i ask what chapter will "Q5" be explained?